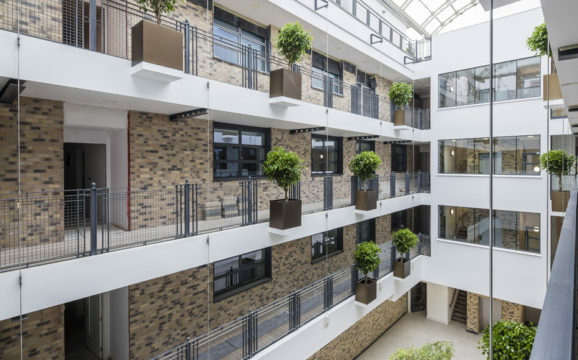 We were appointed by a developer client to produce a landscape architect ’s tender package of information for an internal atrium space associated with a refurbished residential development. Our detailed design was developed from a design intent visualisation produced by others. Our scope was limited to the planted and planter elements of this atrium space only. Our appointment covered two specific elements. 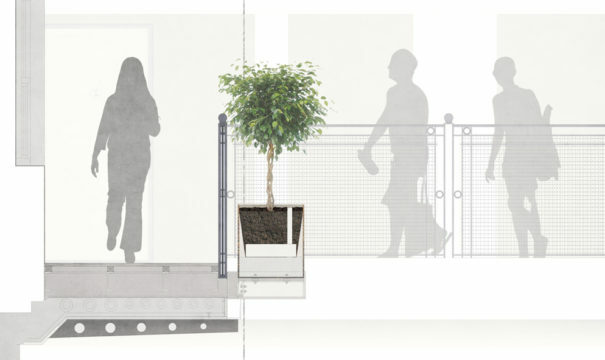 Firstly, we were tasked with the technical landscape design of a ground level planter located over a structural slab. Secondly, we were responsible for the technical design of cantilevered pots which were to be arranged outside of proposed balustrades to residential walkways. The ground level planter needed to be an in situ self contained planter. The planter needed to accommodate drainage with outfalls to a silt trap, an automated irrigation system and decorative lighting. 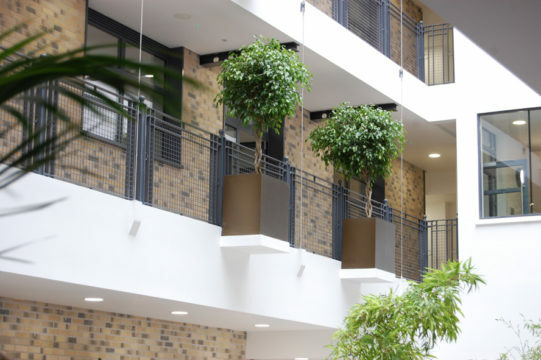 Our landscape architects carefully coordinated our proposals with the civil engineer and electrical engineer to ensure a this element of design was aesthetically pleasing whilst providing a growing environment in which the planting would continue to thrive. The cantilevered pots, located on the outside of the balustrades, needed to be fixed to a structure which was tied back to an existing load bearing structure. Therefore, the overall weight of the proposed pot and its contents was critical in ensuring these elements did not fail. Our landscape architects worked closely with the structural engineer to ensure the structural integrity of the proposed pots’ fixings and their supports were fit for purpose. In addition, the health and safety associated with the maintenance of these pots was carefully considered at an early stage of the design process. Each pot was designed with an integral irrigation reservoir to ensure the plant remained healthy whilst providing an easy method of maintenance. Our landscape architects gave special attention to the species of planting contained within the ground level planter and the raised pots to ensure they continued to thrive through time in these specific conditions.